We're nearly a week into the new year, and I'm finally sitting down to pen my resolutions here online. I had started jotting ideas on paper near the end of December, but they've been swirling around in my mind for much longer. Back when December rolled around, it had felt too early to start making new resolutions. After all, I still had an entire month to go—a whopping 1/12 of a year! And I couldn't just brush that off as though nothing would get accomplished. So I'd have to wait and take stock of myself at the very end of the year, I'd thought, to be the most accurate. Hah. And then the new year came and passed, and I still wasn't feeling ready. I wanted a clean, fresh start, with everything planned out and organized so I could implement my new changes immediately, with awesome tracking systems already in place to hold me accountable. But I have so many pending to-dos and lots of writing to catch up on, my room is once again in need of a cleaning, and I'm leaving for a week tomorrow and haven't even thought about packing yet. Hence my avoidance of this very post, while spending the entire past weekend and my evenings thus far this month writing less time-sensitive posts instead. So logical. But a date is just a date, and there will never be the perfect time for a fresh renewal. So I'm ready to reflect and reset as is, despite the chaotic, urgent feeling that's currently hovering over my day-to-day, reminding me of everything I've been meaning to do, but haven't yet done. I did get the juices flowing when I wrote about my teaching and travel resolutions yesterday for the monthly Reach to Teach blog carnival, which takes a different angle than where I think this post will lead, but nonetheless helped me focus. So to begin, I think it'll be beneficial to take a quick peek back at where I was last January, in order to see what exactly has happened since. My only 2014 wrap-up so far has been my year in books, so I haven't yet done this—even in my mind. Improve health, focus on digestion. Launch health site and post regularly. Do not work a 9-5 job after my teaching contract ends. While my diet has progressed in the past year (more whole foods, even less processed than before), and I've learned a ton about nutrition and real food through various books and documentaries, I still have the same IBS issues I was struggling with a year ago. Le sigh. Since creating the health site last year, I've written and published 29 posts there, the first one on February 6, 2014. So since my aim was to write weekly, you could look at it as either 29/52 or 29/42, depending on whether or not we take into account the fact that it wasn't up and running until February, and I was off the web during four weeks of the Camino. Either way, I want more consistency in 2015, and a higher fraction. The fact that I reached and am living my third goal is still hard to believe, as I had serious doubts, but a magical opportunity arose at the perfect time, and here we are—for now. My income is still hourly now though, and comes from one source, so I want to focus on diversifying this year and venturing into new territory. After one of my more challenging years thus far (in Korea), chopping off my hair, walking the Camino, and unexpectedly seeing death up close this fall, 2014 has set me up such that I want to take more risks and push my comfort zone. I feel a drive to do things I wouldn't normally do, be more vulnerable in what I write and the opportunities I seek, and keep on growing. I need to remind my currently-frantic self that these are the new year's resolutions. Y-e-a-r. I have to progressively make small changes over time, such that I become more closely aligned with them bit by bit. I also need to remember that the steps each month need to be tiny and easily attainable. Reach a high intermediate level of French. Diversify my income to three sources. Eat a whole foods, plant-based diet; improve digestion. Now let's take a closer look at each, one by one. Label items from my bedroom in French. Label items in the kitchen in French. Learn the words to one French song every month. Practice French in some capacity for 10 minutes every day. Watch one French movie every month. Spend a half an hour researching opportunities in France. Buy a plane ticket to France. 2. Diversity my income to three sources. As I mentioned above, I want to diversity my income this year, and three sources will give me something concrete to aim for, while still allowing flexibility in the modes. I plan to actually, for real this time, use elance and fiverr, to see what can happen with those. I also want to create and sell some e-guides, which I talked about more in my blog carnival resolutions post. It'll take tons of hard work and the courage to step on uncharted lands, but I would love to see these projects through to completion. I can always experiment with Helpouts or teaching online, too, but I'd like to see where freelancing can take me. Or where I can take it. There are stacks of books here at home that I'm going to try to sell online, which could possibly be another income source. I've thought about making or selling post cards / cards a little bit on the side, but that's also another 1-1 time commitment. Racking my brain for something I could make just once to sell again and again. Apply to 5 elance jobs. Create one profile on fiverr. Spend an hour 3x/week working my Korean food eguide. Spend an hour becoming familiar with Pages. Ask other bloggers what programs they used to design ebooks/pdf guides. List five books online to sell. Spend 20 minutes brainstorming post topics for HYH. Introduce a new whole food into my diet each month, or eliminate a processed one. Plan for an elimination diet. Begin reading another whole foods plant-based diet book. Re-read an IBS book from my shelf, or browse. So those are my three main resolutions, but wait—there's more. I'm also going to let one word guide my decisions and actions this year, and that word is create. I've been thinking a lot the last couple of months—and perhaps I've mentioned it here before—about creating and consuming. Although I'm not as social media attached as some of my peers, I still feel as though I do an awful lot of consuming with all of the blogs I read and follow. And as much as I enjoy reading them, it does narrow my thinking, usually before I can realize what's happened. I'll end up comparing myself to others, and instead of getting inspired, I'll feel really "behind" and unsuccessful. Those aren't great feelings, so I want to restructure my time such that I'm doing way more creating than consuming. I'm putting books into the creating camp, because you're creating new knowledge. I feel good when I read, and I know it's beneficial, so I want to do even more of it this year than last. I might try implementing some daily "non-internet hours" to consume less, or simply non-computer hours to read more. And although I only watch at max a few TV episodes online a week (still working my way through "Gilmore Girls," you guys, I'm in the 6th season right now), I've played with the idea of tracking TV vs. reading time or something like that. We'll see. The point is that the idea of creating kept surfacing again and again over the last several months, so I need to address it and embrace it. I didn't just decide to choose a single word for the new year, as some do every year. It chose me, and I listened. Read 35 books. Track TV vs. reading time? Actively study or use Spanish 3x/week. Develop a daily stretching routine/habit. Phew! What am I forgetting? (Anyone...?) As always, I'll be checking back every month to see how I'm progressing, and to adjust and set specific, actionable goals for the following month. 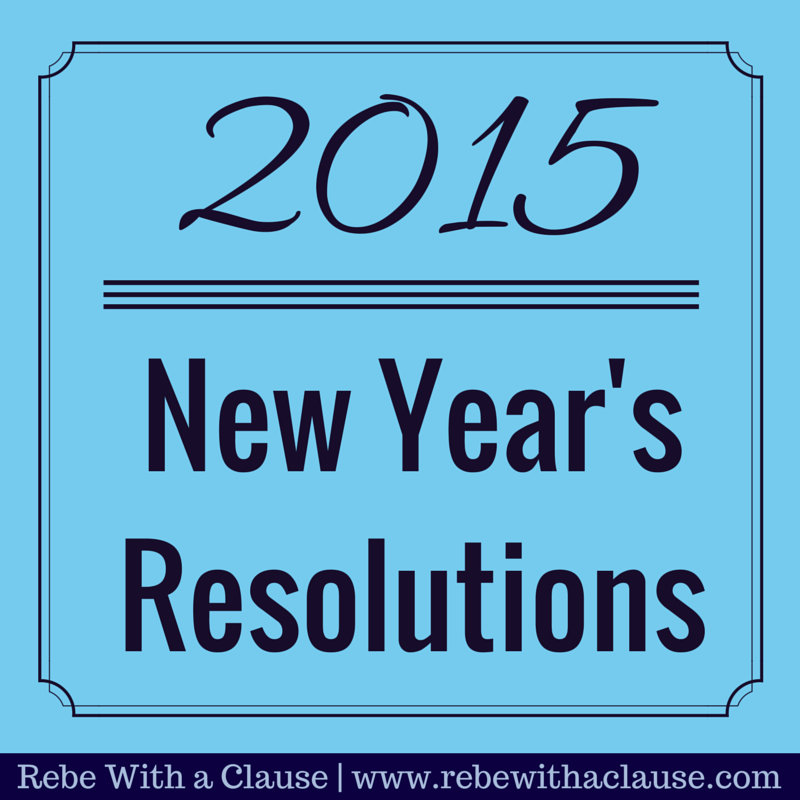 My resolutions tend to morph a bit every year as time goes on, but I think that's only natural. I welcome you to join me in this quest of self improvement! Have you made any resolutions this year? Ever tried focusing on a single word for a year—did it work for you? I have been surprisingly happy with selling on fiverr. I originally had a lot of teach-y gigs, but I deleted some adjusted others and make a nice side income. I call it my "birthday" money because I usually use to to by people their birthday gifts! Thanks so much for the encouragement - knowing this really helps with motivation! So you teach ESL through fiverr? Or sell some other sort of teaching-related gig?